This past Sunday children, parents and community members celebrated Easter in a big way while welcoming the Easter bunny and more at the ‘A Sp’egg’tacular Easter Event’ on the historic grounds of the Ireland House museum on Oakridge Farm. Once again this year, as a presenting sponsor we were thrilled to be a part of this special community event, which raised funds needed for the Museum of Burlington’s educational programs and the preservation of the historic collection. 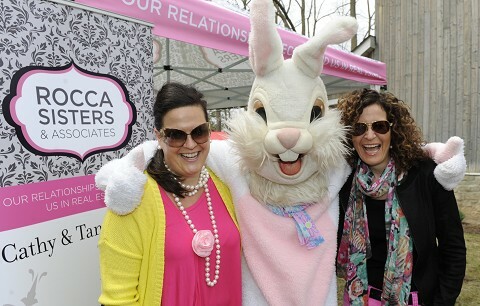 Admission was free to the Easter event and compliments of Rocca Sisters & Associates. This was our way of saying thank you to the community for all the support you have given us throughout the year and for making us #1 in Burlington for Sales Production and Volume for Royal LePage in 2013. What were event goers most eager about? The egg hunt of course, which happened on an ongoing basis this year from 11 a.m. until 2 p.m. and saw kids of all ages running to collect plastic eggs which they then redeemed for free goodie bags. Families enjoyed the many activities offered throughout the day including visits with the Easter bunny, children’s bazaar, Ireland House museum tours, games, egg dying and decorating demonstrations, historic cooking, vendors and exhibitors. To celebrate spring, compliments of the Rocca Sisters & Associates, we gave out free flower pots to children and helped each child plant flowers in their pots. For photos from the event visit the “Our Community” section of our website, http://www.RoccaSisters.ca. To watch our event video, visit our webTV channel, http://www.RoccaSistersTV.ca. From our family to yours, we wish you a safe & happy Easter weekend and we look forward to seeing you at our next Community Giveback Event! WIN A MERCEDES-BENZ: JOIN US AT THE MERCEDES-BENZ OAKVILLE 10K! One of the fastest growing running events in Ontario is set to draw in thousands next month. We’re excited to team up with Mercedes-Benz Oakville as an official primary sponsor of the Mercedes-Benz Oakville 10K presented by New Balance Oakville. It’s the only 10K race in Canada where someone wins a Mercedes-Benz. On April 27th, Mercedes-Benz Oakville will provide the keys to a 2014 CLA, by way of a random bib draw, to one lucky 10K or 5K finisher. Starting and finishing on the sprawling park-like campus of 102-year old Appleby College, runners will experience a beautiful route winding its way through picturesque downtown Oakville and including stunning views of the lake. This community event has something for just about everyone. In addition to the 10K and 5K run/walk, teens will have the chance to participate in the 5K High School Challenge. The first school to have three runners cross the 5K finish line will be declared the fastest high school in Oakville. The little ones won’t be forgotten either. The Oakville 10K also features a 1K Junior Jog and a 300m Toddler Trot. The Appleby Family Fun Zone will have children’s activities scheduled for the morning. For the Rocca Sisters & Associates, giving back to our local communities is our passion. Funds raised through this event will be donated to the Oakville Hospital Foundation to purchase essential medical equipment for the new Oakville Hospital. 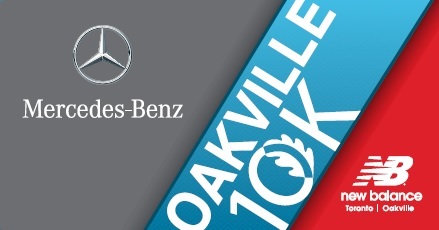 To register for the Oakville 10K, visit http://www.Mercedes10k.com. Meet us at the Rocca Sisters & Associates tent on event day for free giveaways and more. We look forward to seeing you on April 27! Comments Off on WIN A MERCEDES-BENZ: JOIN US AT THE MERCEDES-BENZ OAKVILLE 10K!